Clear stamps from Uniquely Creative featuring flowers and the sentiments "Your potential is endless", "Never forget your own worth", and "Don't give up". Clear stamps featuring a floral frame and the sentiments "Look for the miracles" and "Sending love and hugs". Fancy tailed doves coupled with a blossom filled dogwood branch are the perfect accents to grace spring and Easter themed card fronts, scrapbook layouts and even altered art pieces. But, their appeal and versatility doesn't stop there! These peaceful and quaint illustrations are ideal to use for so many different occasions, from sympathy to wedding to happy birthday wishes, and will be a stamp assembling you will reach for over and over again! This cling stamp set is part of the Flowering Dogwood Collection and pairs with the Flowering Dogwood and Doves Die. 1. Seated Dove 1: 2.75" x 2.0", 2. Seated Dove 2: 2.5" x 1.75", 3. Dove in Flight: 3.0" x 2.25", 4. Blossom Filled Branch: 4.25" x 3.5". 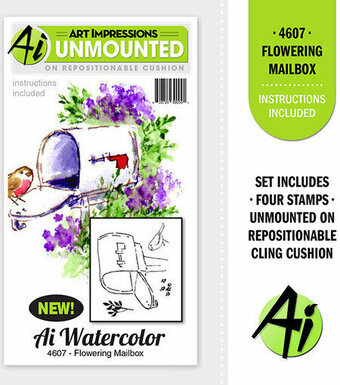 Watercolor Mini Unmounted Rubber Stamps from Art Impressions featuring a mailbox with flowers. Cling Stamps from Impression Obsession featuring flowers. Sauntering along a garden's edge provides a relaxed and calming effect, and the Garden's Edge Coneflower Cling Stamp Set will allow you to experience that wonderful feeling from within your crafty space! The beautifully detailed coneflowers and floral accents within this assembling are ideal for pairing with the coordinating dies to create beautiful garden themed embellishments, or to stamp repeatedly, creating your very own decorative borders and backgrounds! The perfect assembling of images to bring together your very own backyard garden! Approximate Image Sizes: 1. Single Garden's Edge Coneflower: 2.75" x 2.0", 2. Garden's Edge Coneflowers: 2.5" x 2.5", 3. Garden's Edge Tall Coneflowers: 3.5" x 4.0", 4. Garden's Edge Wildflower Accent: 3.0" x 2.25". These cling stamps are ready to use with Acrylic Blocks. Included with stamp set: 1. Storage panel for use with a two or three ring binder, 2. Stamp packaging can also be used as a storage box for the stamp(s). Penny Black wood mounted rubber stamp featuring flowers. This solid, multistep stamp set makes quick work of gorgeous blooms. Many of the flowers include flower centers than can be stamped in a complementary color, and the set includes greenery that add just the right touch to your floral creations. In Bloom features our revolutionary Smart Align system that ensures lining up the intricate flower images with your Die-namics will be a breeze. This 22 piece set includes: Components that layer and combine to create 13 flowers and foliage measuring 2" x 2", 1 1/4" x 1 1/4", 1 1/8" x 1", 1" x 7/8", 1" x 1", 7/8" x 2 3/8", 1/2" x 1 1/4", 5/8" x 1 5/8", 1/2" x 1 5/8", 3/4" x 1 1/4", 1/2" x 1 1/2", 5/8" x 1 1/2", 1/2" x 1 5/8". Clear stamp sets include the name of the set on the sticker for easy identification. Our clear stamps and Die-namics are made in the USA. Cling Stamp from Impression Obsession featuring Iris flowers. 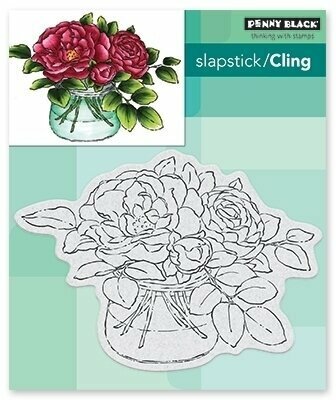 Large Peonies Cling Rubber Stamps Just Add Color Collection by Stephanie Low is a beautiful cling foam (EVA) rubber stamp that will enhance your projects to the next level! Designed to be used with an acrylic block. Just Add Color Collection by Stephanie Low gives you fantastic detailed floral designs. Just Add Color to customize projects by using markers, paints, color pencils and more to bring them to life! Approximate Size: Leaf Sprig: 1.35 x 1.90 in. 3.50 x 4.80 cm, Small Flowers: 1.35 x 1.90 in. 3.50 x 4.80 cm, Medium Flower: 2.20 x 2.20 in. 5.50 x 5.50 cm, Large Flower: 2.45 x 2.35 in. 6.50 x 5.90 cm. Cling Stamp from Impression Obsession featuring a background of pansy flowers. Little Flowers Cling Rubber Stamps Just Add Color Collection by Stephanie Low is a beautiful cling foam (EVA) rubber stamp that will enhance your projects to the next level! Designed to be used with an acrylic block. Just Add Color Collection by Stephanie Low gives you fantastic detailed floral designs. Just Add Color to customize projects by using markers, paints, color pencils and more to bring them to life! Approximate Size: Small Single Blossom: 1.00 x 1.00 in. 2.50 x 2.50 cm, Medium Single Blossom: 1.30 x 1.25 in. 3.50 x 3.50 cm, Small Flower Cluster: 2.55 x 1.70 in. 6.50 x 4.50 cm, Large Flower Cluster: 3.10 x 1.90 in. 7.80 x 4.80 cm. Cling Stamp from Stamping Bella featuring a flower and the sentiment "Hey There". Love themed Impression Obsession cling stamp featuring a heart and flowers. Cling Stamp from Impression Obsession featuring a single flower. Filled with quaint and exquisitely detailed illustrations, the Lush Lilac & Umbrella Spray Cling Stamp Set brings a sweet and gentle old world charm to all of your spring themed projects! A lilac filled parasol, several lilac sprays and a charming butterfly present the perfect chance to showcase your incredible coloring skills! The ideal assembling of images to use as main focal points, hand stamped backgrounds, or as dimensional embellishments on scrapbook layouts and mixed media projects! Approximate Image Sizes: 1. Umbrella Lilac Spray: 4.5" x 3.25", 2. Cascading Lilac Spray: 4.0" x 2.25", 3. Lilac Blossom: 3.0" x 2.25", 4. Butterfly: 1.0" x 0.75". These cling stamps are ready to use with Acrylic Blocks. Included with stamp set: 1. Storage panel for use with a two or three ring binder, 2. Stamp packaging can also be used as a storage box for the stamp(s). 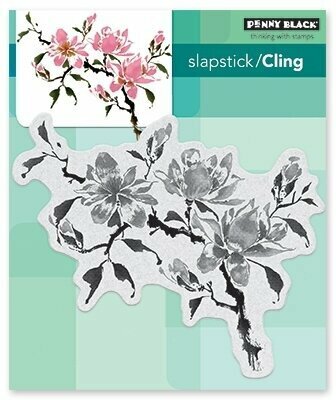 Penny Black slapstick cling stamp featuring Magnolia Flowers. Mandala Blossoms Cling Rubber Stamps Just Add Color Collection by Stephanie Low is a beautiful cling foam (EVA) rubber stamp that will enhance your projects to the next level! Designed to be used with an acrylic block. Just Add Color Collection by Stephanie Low gives you fantastic detailed floral designs. Just Add Color to customize projects by using markers, paints, color pencils and more to bring them to life! Approximate Size: Flowers: 1.75 x 3.20 in. 4.50 x 8.50 cm, Mandala: 3.20 x 3.20 in. 8.50 x 8.50 cm. Mandala Bouquet Cling Rubber Stamps Just Add Color Collection by Stephanie Low is a beautiful cling foam (EVA) rubber stamp that will enhance your projects to the next level! Designed to be used with an acrylic block. 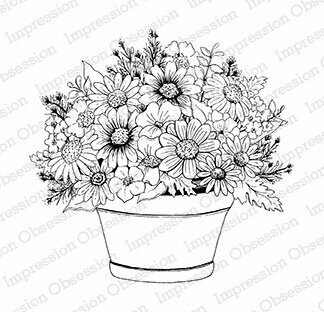 Just Add Color Collection by Stephanie Low gives you fantastic detailed floral designs. Just Add Color to customize projects by using markers, paints, color pencils and more to bring them to life! Approximate Size: Flowers: 2.25 x 3.05 in. 5.70 x 7.70 cm, Mandala: 3.25 x 3.20 in. 8.50 x 8.50 cm. Inkadinkado's Meadow clear stamp set is perfect for your nature theme cards and crafts. Use these beautifully detailed stamps with one of Inkadinkado's clear acrylic mounting blocks, sold separately. Sheet size: 4" x 8", set of 5 stamps. Watercolor Mini Unmounted Rubber Stamps from Art Impressions featuring an Open Window with flowers. Cling Stamp from Impression Obsession featuring a Poppy flower. Christmas themed Impression Obsession clear stamps featuring a penguin. This is a clear photopolymer stamp set measuring 4 x 8 inches. Our clear stamps are made in the USA from the highest quality photopolymer. Peonies Bundle Cling Rubber Stamps Just Add Color Collection by Stephanie Low is a beautiful cling foam (EVA) rubber stamp that will enhance your projects to the next level! Designed to be used with an acrylic block. 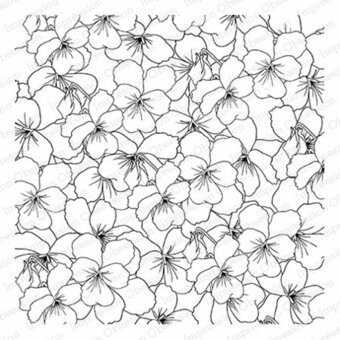 Just Add Color Collection by Stephanie Low gives you fantastic detailed floral designs. Just Add Color to customize projects by using markers, paints, color pencils and more to bring them to life! Approximate Size: Small Peony: 2.05 x 2.70 in. 5.50 x 6.80 cm, Medium Peony: 2.20 x 2.20 in. 5.50 x 5.60 cm, Large Peony: 2.40 x 2.15 in. 6.50 x 5.50 cm . Fill your spring and summertime creations with delicately ruffled peony blossoms and beautiful peony buds! Create romantic, one of a kind hand stamped backgrounds, graceful repeating borders, or opt to utilize with the coordinating dies to create captivating dimensional embellishments! These beautifully illustrated cling stamp images are also the perfect elements to use as layering bases for your dimensional peony blossoms! A charming and nostalgic flower ideal for card fronts, scrapbook layouts and altered art pieces alike! Approximate Image Sizes: 1. Small Peony Bud: 2.25" x 2.0", 2. Large Peony Bud: 3.25" x 3.25", 3. Small Peony Blossom: 2.5" x 2.0", 4. Large Peony Blossom: 3.5" x 3.0". These cling stamps are ready to use with Acrylic Blocks. Included with stamp set: 1. Storage panel for use with a two or three ring binder, 2. Stamp packaging can also be used as a storage box for the stamp(s). The Plentiful Petals stamp set features bold, beautiful flowers and petals designed to layer beautifully in creating multi-color bouquets and standalone blooms. We've made it easy to optimize your crafting by outlining the images designed to layer together. Plentiful Petals features our revolutionary Smart Align system that ensures lining up the intricate stamped flower petals with your Die-namics will be a breeze. 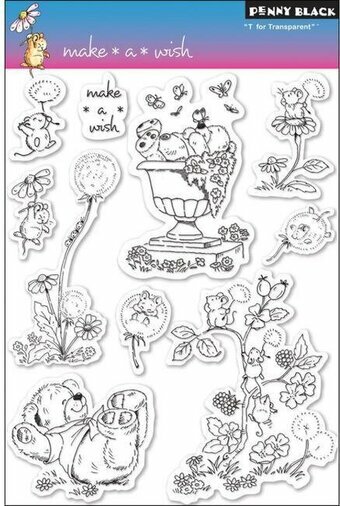 The 22 piece Plentiful Petals stamp set includes: Flowers (9, assembled) measuring 2", 1 7/8", 1 1/2", 1 1/2", 1 1/2", 1 3/8", 1 1/4", 1", 5/8", Leaves (4) 1/2" x 1", 1/2" x 1", 3/8" x 3/4", 3/8" x 3/4". Clear stamp sets include the name of the set on the sticker for easy identification. Our clear stamps and Die-namics are made in the USA. Impression Obsession cling stamp featuring a background of poinsettia flowers. Perfect for Christmas. 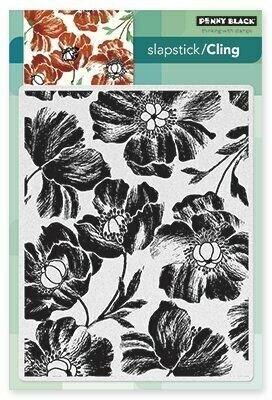 Penny Black cling rubber stamp featuring a background of flowers. Penny Black slapstick cling stamp featuring a rose flower. Impression Obsession cling stamp featuring a heart made of flowers. Penny Black slapstick cling stamps featuring beautiful rose flowers. Cling Stamp from Impression Obsession featuring a bouquet of flowers. Hero Arts and Basic Grey clear stamps featuring flowers and the sentiments "Lovely" and "Good Times". Cling Stamp from Impression Obsession featuring an arrangement of Spring flowers. Clear stamps from Uniquely Creative featuring Spring flowers, "Smile like it's always Spring", and "Believe in yourself".